Okay, are you ready to work your tail off for this delicious confection? I probably did it the hard way but I'm telling you, it was worth every effort when my husband and I took our first bite into this moist coconut cake. How I went about this was through research and reading ingredients online and wondering if my coconut cake idea would work out with a particular white cake mix. 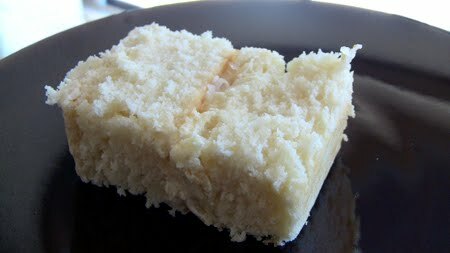 After some time with reading reviews I found a white cake recipe that is absolutely best for this cake. I made a double layered cake and added coconut shavings in the middle frosting for texture. What I'm about to share is a recipe derived from an Allrecipes member who calls this "Heavenly White Cake." Indeed, it is truly heavenly and sinfully decadent for a white cake especially when you compliment it with your favorite white/vanilla store bought or homemade buttercream frosting. My mind shut down on daily calorie intake while making this. It was a great new experience and I will keep this recipe as a family favorite. Preheat oven to 350 degrees F (175 degrees C). Grease your pans of choice. The original recipe calls for a 15 x 10 x 1 pan. I used two 8 x 8 square pans. Sift dry ingredients three times: Cake Flour (yes it's sifted but sift again you must), baking powder and salt. In a bowl, beat egg whites until foamy. Then gradually add 1/2 cup of sugar and keep beating till eggs form soft peaks. I recommend bringing your eggs to room temperature 30 minutes prior. Keep beating your eggs and do not give up hope, they do eventually get foamy. In another bowl, cream butter. Gradually add the rest of the sugar. Get the consistency to a creamy state. Alternating, add the milks (coconut & milk) and sifted ingredients into the butter mixture. Continue to beat after each ingredient gets added. Add your vanilla and beat well. Finally, fold in your eggs and mix well with a spatula. Pour mixture into your pan(s) and bake for approximately 25-30 minutes. Your cake should be done when you poke a toothpick (I had a thin steak knife) into the center of the cake and the toothpick/knife comes out clean. Let cool in pan for about 10 minutes. Remove cake from pan and let cool on wire rack. For frosting, let cake cool completely. 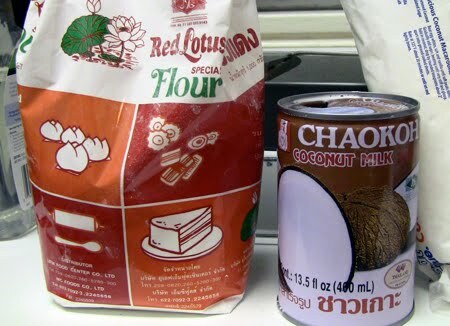 Just in case you want to know what the packaging looks like for the flour and coconut milk I used. I had the pleasure of visiting La Madeleine French Cafe for the first time yesterday. Usually I just pass by the store and think about getting a pain du chocolat (chocolate croissant) but never following through. Lucky for me, I had my sister and her family in town this past week and she is a French food lover. So we stopped by their bakery and bought a fruit tart and a lemon tart. Yummy! 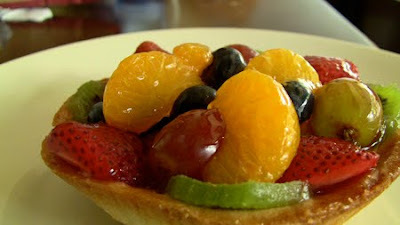 I tried the fruit tart and found it to be exactly the way I imagined the taste to come off...lightly sweetened, cool and creamy. It was the opposite for my lemon tart. My lemon tart was not quite as tart as I would have wanted and there was too strong of a taste of evaporated milk. Oh well, it was passable nonetheless. I did fill out a survey in hopes that they improve their lemon tart. I don't give up on food and restaurants that easily unless the service was a nightmare. And believe me, I'm an extremely patient and understanding customer. Anyway I just wanted to share my experience with you at a local La Madeleine cafe. I would definitely visit again because there was so much more I haven't experienced.